Category Archives for "Kabuki Drop Resource"
MagicKabukiDrop.com was created to share information on all aspects of the Kabuki Drop for use in theatrical productions, plays, musicals, shows and special events. If you are a theatrical stage practitioner (on or off stage), a Kabuki Drop can be used to add a dramatic wow-moment to your show or act. It is also a great device for product reveals for corporate events. 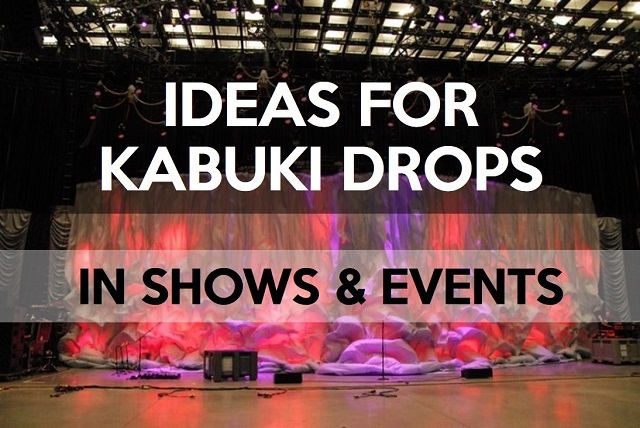 Here are some different ideas for Kabuki Drops in shows and events. A Kabuki Drop is a stagecraft technique and a release system that drops an open suspended curtain to the floor for a dramatic reveal. A curtain or drape is suspended and held open by a specially designed system that holds the cloth securely until it is needed to be released. The system is generally attached to some kind of overhanging horizontal support structure like a flying bar or lighting truss. The trigger mechanism to release the cloth can be activated either manually or electronically. The modern-day Kabuki Drop finds its roots in the historic Japanese dance-drama, Kabuki Theatre. Traditionally, a curtain drop was used as a stagecraft technique to reveal a change of a scene. This technique was known as “Furiotoshi”, which literally means, “shake down to reveal”. A Kabuki Drop can add tremendous visuals and theatrical texture to any show or event. The most obvious way to use the Kabuki Drop is as a direct reveal in a show or event. It is often used in theatrical stage performances or special events to reveal a cast of performers, stage set or product. You can also have a logo or brand identity, printed or silk-screened on the curtain; although most modern applications use video projection instead. At the top of a show or event, a white curtain (cloth) hangs down and covers the front of the stage. An introductory teaser video is seen via projection on the curtain to introduce the show, event, product or performers. At the end of the video, the curtain drops for the reveal. This is a great way to create a spectacular customized opening for a show or event. Check out this video from a Volkswagen launch that demonstrates how a cool animation sequence can be integrated with a Kabuki Drop. Here is an example of combing dance with video mapping/ animation for a reveal sequence for Volvo. This is a simple but very dramatic and visually appealing sequence you can incorporate with a Kabuki Drop. This theatrical effect creates anticipation and suspense. It has been used for many theatrical shows such as the Blue Man Group and you can see how the band One Republic uses this concept to great effect for the opening of their show. Here is an idea to create an even stronger visual “magical” effect to reveal a person or group of people. A white Kabuki Drop curtain hangs in front of the stage. A single light is set on stage upstage (towards the back of the stage). It projects onto the back of the curtain so that the curtain is illuminated. In sync with appropriate music, the person(s) literally walks slowly from behind the light, step over and walk forward downstage (towards the curtain). The audience will see the person(s)’s silhouette “magically” appear and grow larger. The curtain drops and reveals the person(s). This is a simple but very effective way to introduce a performer(s) or VIP. One variation of the Kabuki Drop is the advent of the “Double Kabuki drop”. The traditional drop is a SINGLE Drop. That means the curtain will already be opened up in place and covering the stage. 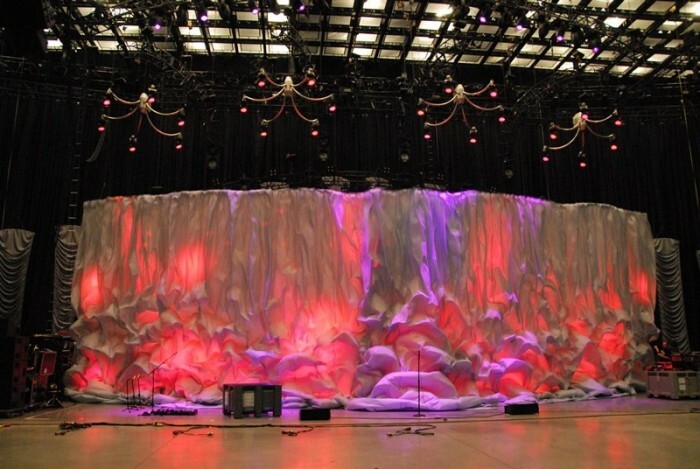 Activating the curtain drop will drop the curtain to the floor revealing what is on stage. A double drop can be activated either manually or electronically and ANY system can be adapted as a double drop. 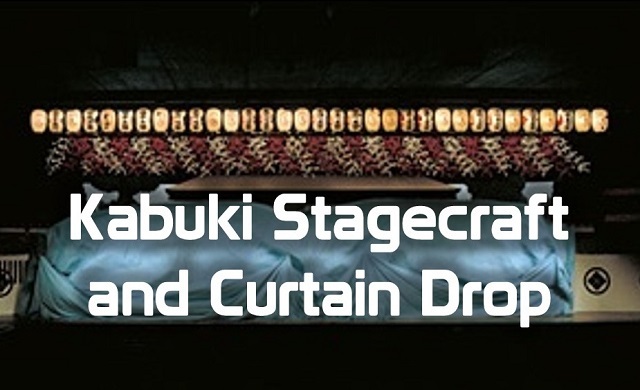 The Double Kabuki Drop can be used as a cover device to set an illusion or change a stage set as a visual change from the traditional main or Austrian curtain. This is also particularly useful for stages that do not have a main curtain that can be closed for set stages. A double drop can be used to create an awesome “magicial” appearance, using the cloth as a cover. Check out this video from illusionist, Brett Daniels’, old show. The effect in question is at the top of the video. Nuff said! 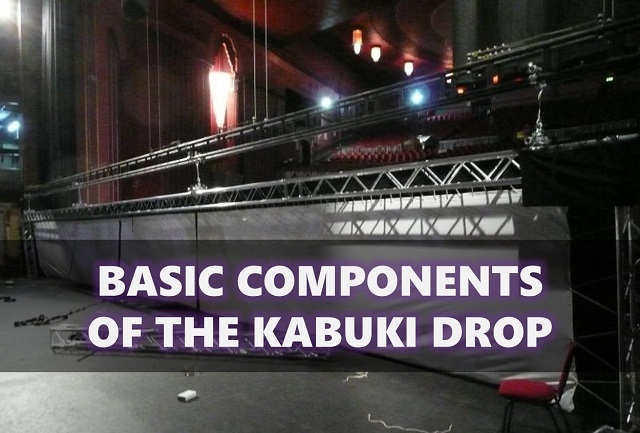 For some shows or events, there is a need for an all-round or surrounded Kabuki Drop. This means the curtain covers all four sides of a reveal area or it can be circle or oval-shaped. This is necessary if the audience is surrounding the reveal area such as an arena, shopping mall, open space or circus. In this set-up, the Kabuki Drop system must be running in a series under and around a square, rectangular or round overhanging structure like a lighting truss. The trigger mechanism must activate all drop points to drop all sides of the curtain at the same time. The curtain comprises of one large “circle” or material. A kabuki drop with a lightweight cloth combined with a sniffer or motor-pull can create a beautiful reveal. This means after the cloth is dropped, it does not drop to the ground but looks like it gets “sucked” up into the ceiling. I actually came up with my first DIY Kabuki Drop for a friend in 1996 for his church event. It was a glitter drop where a bunch of confetti dropped from the top of the stage. In this case, a curtain is not dropped to the ground for a reveal but is used as a holder for the glitter. The Kabuki Drop is a cloth “hammock” that holds all the confetti. A Kabuki Drop system releases one long end of the cloth “hammock” that allows the confetti to drop to the stage floor. The glitter drop can be used at the end of an event to create an even “snowfall” of confetti and can also be used as a holding device can also be used to drop other items like balloons, ping pong balls and anvils… ok, maybe not anvils. For magic & illusion performances, magicians can use the Kabuki Curtain to cover a large illusion or finale set piece and reveal it when needed. A double Kabuki Drop can also be used in conjunction with an illusion utility such as an illusion deceptive base or Black Art Table. The first drop unrolls the curtain and is used as a cover. The second drop drops the curtain to the base or table to reveal the appearance or vanish. This gives a nice remote-look to the cover device for the illusion, enhancing the visual look and magic-feel of the effect. My “Shadow Appearance” illusion uses a self-contained cloth drop system and I have also invented a professional manual Kabuki Drop system that is mounted onto flying or lighting bars/ trussing. Do you have any ideas to share? Leave a comment! 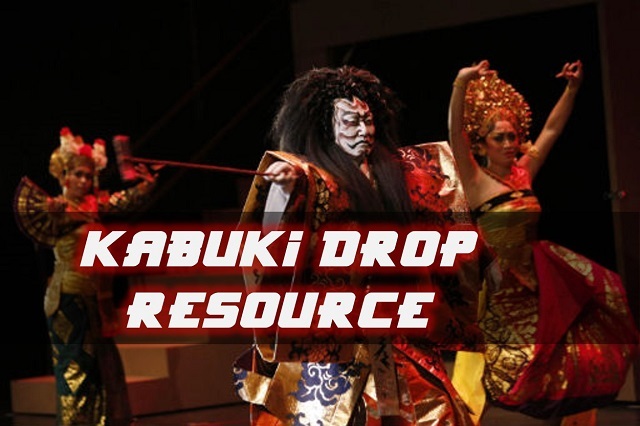 If you are a stage or theatre practitioner for shows or events, you might want to include the “Ultimate Kabuki Drop Resource” in your library. Besides being the definitive resource on Kabuki Drops, the book includes six original designs for Kabuki Drops that are easy and inexpensive to build. There are different plans for different needs & venues with original ideas and design elements. Available as a full-colour print book and an eBook here. 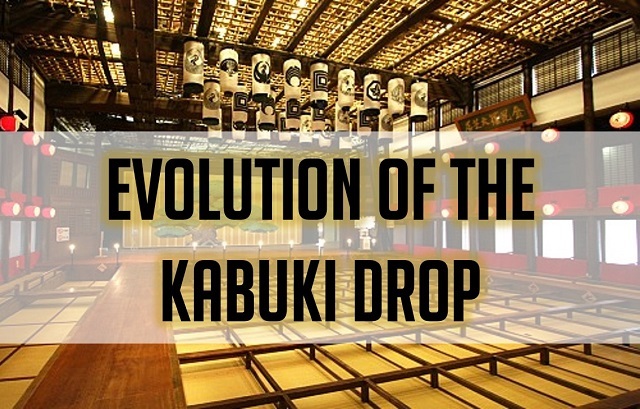 What is a Kabuki Drop? In this comprehensive resource, we will explore the history, techniques, components, workings and systems of Kabuki Drops. 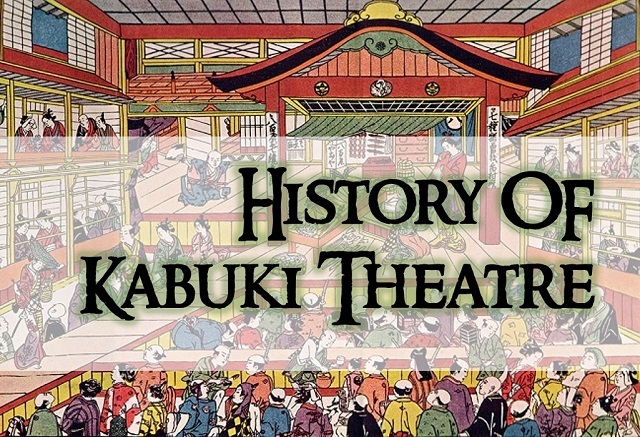 This article explores the brief history of Kabuki Theatre. Kabuki is a classical Japanese dance-drama. It is often referred to as “the art of song and dance”. The word Kabuki is derived from the Japanese verb ‘Kabuku’, meaning out of the ordinary or bizarre. This is the reason why the stylization of drama and the elaborate make-up worn by the performers belong characteristically to the Kabuki Theatre. The history of Kabuki extends for about 400 years, and it was pioneered during the Edo period, which is a period in Japanese history ranging between 1603-1868. Its origin begun in Kyoto, where a shrine maiden, named Izumo no Okuni, would use the city’s dry Kamo Riverbed as a stage to perform unusual dances for passersby. These onlookers would soon find her daring parodies of Buddhist prayers both entertaining and mesmerizing. Soon, other troops began emulating her, and this became Japan’s first dramatic performance form catered to the common people. Slowly over the years, Kabuki evolved from street performances, to performances in theatre and teahouses. By relying on heavily flamboyant makeup (or ‘keshou’), and facial expressions instead of masks, and focusing on historical events and everyday life rather than folk tales, Kabuki set itself apart from the upper-class dance theater form called “Noh”. The unmistakable melodrama provided a unique commentary on society during the Edo period. Till today, Kabuki still lives on as an integral part of Japan’s rich cultural heritage, extending its influence beyond the stage, to television, film and anime. Traditionally, the Kabuki drop was used in the context of the historic Japanese dance-drama, Kabuki Theatre. It was formerly called “Furiotoshi”, which literally means, “shake down to reveal”. Over the years, this technique has been retained in modern theatre to change a scene in an instant or to execute a theatrical reveal. With its adoption in western theatre name, the “Furiotoshi” technique has since been simply referred to as the “Kabuki Drop” within the theatre and event industry. The classical method of the curtain drop involved manual labor, where stage crew members released the curtain manually by way of a pull cord or using a pole that caused the curtain to drop to the floor. Over time, there have been improvements to the manual curtain drop. There have been improvements in design and construction methods with modern materials, making it easier to build and be more reliable. Modern advancements in the curtain drop include the use of electronically powered magnetic systems called ‘solenoids’. These electronic systems trigger the drop of the cloth electronically by activating a lever, spring-loaded pin or electro-magnet, depending on the specific design of the system. A variety of the modern Kabuki Drop is the Pneumatic Kabuki Drop. The Pneumatic Kabuki Drop system is an electro-mechanical system that uses compressed gas (from a pneumatic air tank) to trigger the drop. When triggered, a switch converts an electric current to air current. The air current activates a pneumatic cylinder with a pin, effecting the curtain drop. In concept and methodology, a pneumatic system works almost identically to an electronic (linear solenoid) drop system. This resource will not explore pneumatic systems but you can explore the following references. 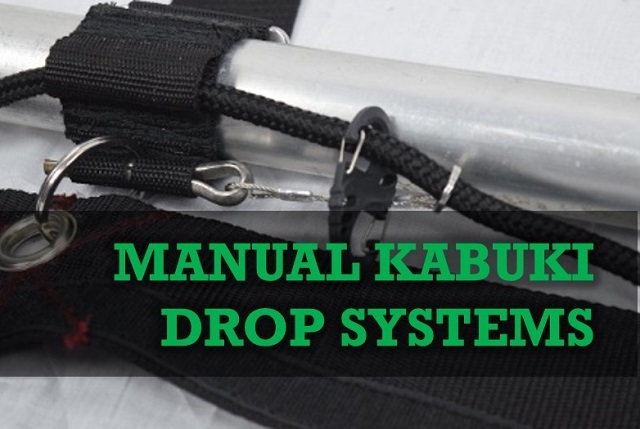 Design plans with measurements of this system are detailed in the book “Ultimate Kabuki Drop Resource: Includes 6 DIY Kabuki Drop Design Plans”. Note: It would be best to first be familiar with the Basic Components of the Kabuki Drop to better understand the systems explored below. Modern designs of the Kabuki Drop use electronic systems that use an electric current to activate the drop point mechanism. The Kabuki Drop can be triggered by a switch and can also be hooked up to a DMX control panel or other split connectors. DMX or DMX512 (Digital Multiplex) is a standard for digital communication networks that are commonly used to control stage lighting and effects. 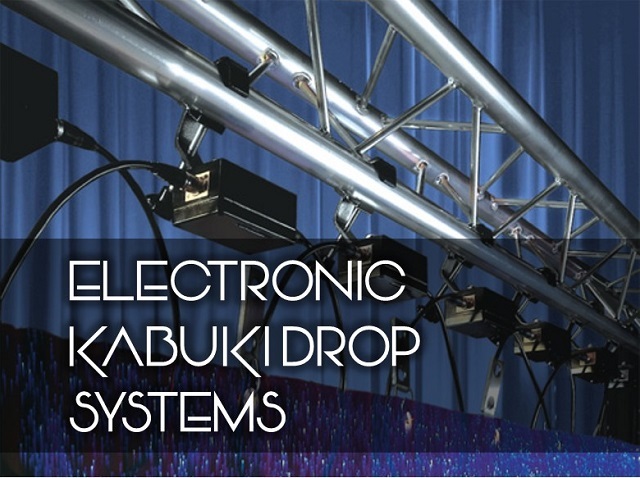 The benefits of electronic Kabuki Drop systems are that they can be triggered remotely, far away from stage and each individual drop point can also be controlled individually if desired. Electronic systems provide precise releases that can be programmed into a DMX control panel and integrated with an elaborate perfectly-timed lighting and special effects sequence. Some reliability problems with electronic systems that result in a failure for a complete Kabuki Drop include a drop in voltage when firing multiple drop units, faulty electronic parts, communication errors or malfunctions with the DMX program. Many models of Electronic Kabuki Drops are also noisy with a distinct loud clicking or buzzing sound upon activation. Electronic Kabuki Drops can be expensive. Renting a system can cost up to hundreds of dollars and purchasing a system will cost thousands. While each system features different type of catches, latches, pins, hooks and release mechanisms, most electronic kabuki drops generally use a solenoid as the main activation mechanism. If you are a copyright holder for any of the images and do not want your image used in this resource site, please contact us at info(a)magickabuki.com and we will remove the image within 24 hours. In its basic form, a solenoid is a long, thin tight coil of wire that produces a uniform magnetic field inside the coil pocket when an electric current is passed through it. A Linear Electromechanical Actuator (LEMA), or simply Linear Solenoid, includes a plunger designed to fit into the solenoid coil pocket. This plunger is typically made from a ferrous square or round metal bar. When an electrical current is passed through the coil of wire, it behaves like an electromagnet and the plunger is “pulled back” or attracted towards the center of the coil by the magnetic flux setup within the coil’s body. It is generally spring-loaded so the plunger returns to its neutral position when the power to the solenoid is cut. The concept of a linear solenoid is to convert electrical energy into a mechanical pushing or pulling force or motion, hence the term “electromechanical actuator”. Generally, in engineering and in the context of Kabuki Drop systems, when the term solenoid is used, it refers to a linear solenoid. The solenoid, which is cylindrical in shape, can be purchased at large general hardware stores or electronic parts stores. This a basic linear solenoid Kabuki Drop system that has a pin secured to the plunger in the form of a threaded rod that is screwed into the plunger head. 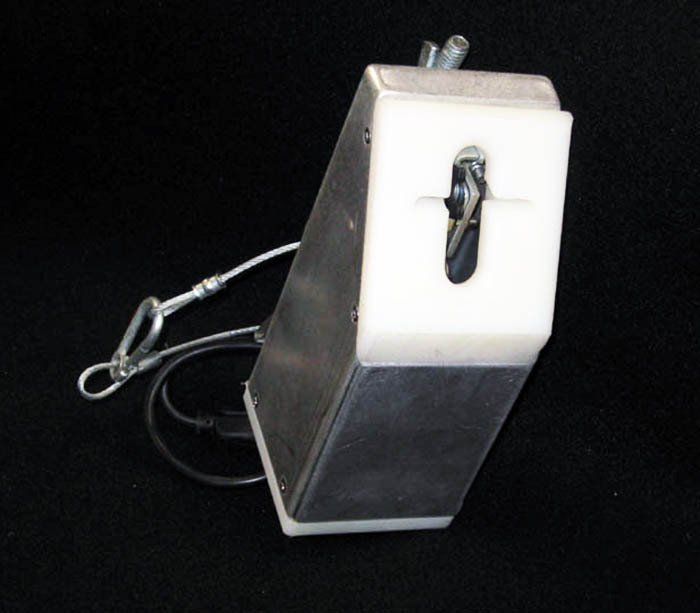 The solenoid cylinder is mounted and encased into a housing (a box made of plastic or metal) and the plunger pin extends out of the housing through a hole drilled through the side of the housing. The entire housing is clamped onto a truss bar and this serves as the drop point for the Kabuki curtain. The curtain is hung on the pins of the drop points via grommets fitted across the top edge of the curtain. A cross section view of the solenoid cylinder is shown below. When electricity is passed through these solenoids, the plungers retract into the housing, causing the pins to be pulled out of the Kabuki curtain which subsequently falls to the floor. A linear solenoid can also be used to release a lever that holds up the Kabuki curtain instead of simply retracting a plunger pin as described in the basic solenoid system above. It can also be used to pull open a gate latch or custom-fabricated arm. This is a modern version of the traditional “rolling pole” Kabuki Drop but uses a linear solenoid to trigger a spring loaded gate latch to rotate the pole with drop points instead of a pull cord. One manufacturer that offers a variation of this system is Showtex. Their system is described in their operation manual here. The Showtex system uses a solenoid system that drops an aluminum bar with drop points (pegs) at a downward angle to effect the curtain drop. The video below describes an electronic version of the “Pins & Loops” Kabuki Drop system. Instead of a pull cord as used in the manual version, this system uses a tensioned-spring to pull all the pins from the loops to release the curtain. 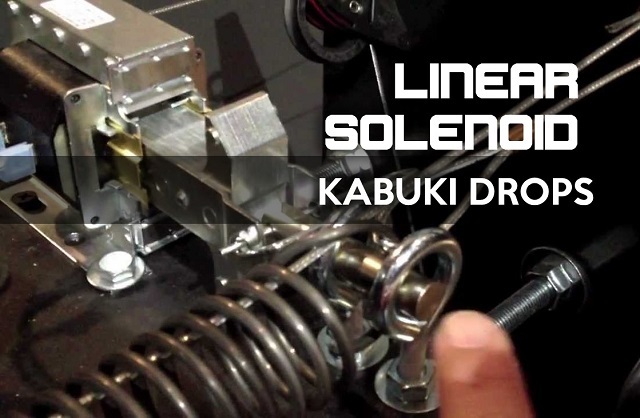 Unlike all other electronic systems, which requires the use of multiple individual solenoid drop point units, this system uses only one linear solenoid that keeps the spring pulled open when the Kabuki Drop is set up. When triggered, the solenoid releases the spring that pulls all the pins from the loops and activates the curtain drop. 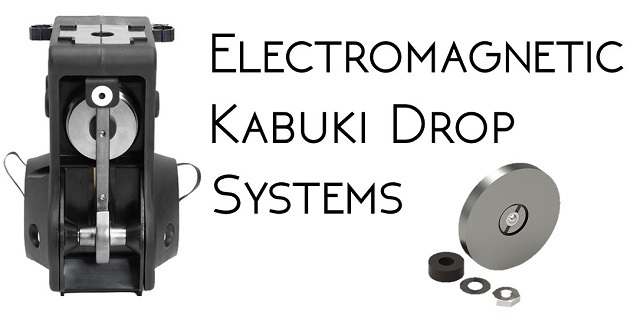 Electromagnetic Kabuki Drop systems do not use linear solenoids but use solenoids as an electromagnet lock. Unlike permanent magnets that are magnetic in their natural state, electromagnets are ferrous metals that only become magnetized when an electrical current is passed through them. This characteristic allows electromagnets to act as a locking system when they are energized. When the electrical current is cut, the electromagnets magnetic powers cease allowing for a release in the locking system. This is similar to the system used in electromagnetic doors in buildings for security purposes. The benefits of an electromagnetic lock Kabuki Drop system are that it an easier electronic system to build as compared to linear solenoid systems. It is also easier to set up than most other systems and it is relatively silent when activated. The downside is that it uses a lot of electricity and the constant electric current required to keep the electromagnets on can shorten the lives of the power cables. As the name suggests, a basic electromagnetic lock Kabuki Drop system uses electromagnets as a lock mechanism. Each drop point comprises of a holding magnet (or electromagnet) and an armature plate. The armature plate is a ferromagnetic plate with a fixing hole that allows it to be attached to the kabuki curtain. It is usually attached to the cloth via rubber grommets. The holding magnet will possess magnetic properties when energized. When the current passes through the magnet, it will cause the armature plate to be attracted to the magnet. This creates a locking action that holds the kabuki curtain in place. During set-up, the holding magnet is clamped onto the flying bar. The armature plate, that is securely fastened onto the curtain is then attached, one by one, onto the respective holding magnets by means of magnetic attraction. When all the drop points are set up, the flying bar is raised up above the stage and the curtain is suspended open. Upon the cutting off of the electric current supply, the holding magnet demagnetizes and releases its grip on the curtain, thus allowing the curtain to fall to the floor. This system uses an electromagnetic lock system in a different way. Instead of directly using the holding magnet to attach the curtain to the drop point, the holding magnet holds up a hook with arm lever where the curtain hangs from. The magnet releases the hook with arm lever when electricity is applied to the unit; a sprung plate ensures release even if a light load is applied.